Daniel Barden, 7, is buried Wedenesday. 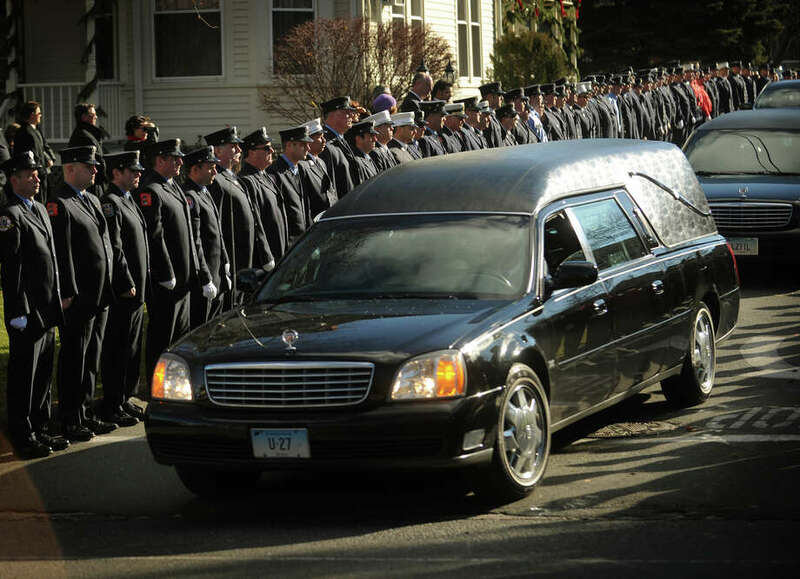 A hearse containing the casket of Daniel Barden, one of the twenty children killed in the Sandy Hook Elementary School shooting, exits as a line of firefighters stand at attention outside St. Rose of Lima Catholic Church in Newtown on Wednesday, December 19, 2012. NEWTOWN -- Daniel Barden, 7, never got the chance to grow up and become a firefighter, but Wednesday he got a firefighter's funeral. More than 100 firefighters from New York City, Simsbury, New London, Lyme and elsewhere, lined the long driveway on both sides, from the curb to the large wooden doors of Saint Rose of Lima Church. They stood at attention in dress uniform as his grief-stricken family passed by in the funeral procession. Some played bagpipes. "We came here to show support," said John Cummings of Ladder Co. 45 in New York City and treasurer of the NYC Firefighters Brotherhood Association. Daniel had cousins who are New York City firefighters. Most got text messages Tuesday telling them Daniel wanted to be a firefighter, too. "We're here to show our support for this community like our community was deeply affected after 9/11. We're here to return the favor," said Lt. Eddy Boles, another NYC firefighter. The church was packed with mourners for the 10 a.m. service. Friends, family, neighbors and classmates were all there. Laura Stamberg and daughter Sarah, 16, came an hour and half away from New Paltz, N.Y. Laura's husband and Daniel's father Mark used to play in a band together. The last time she saw Daniel, he was very small. "I heard he loved to play the drums," said Stamberg, her face fighting back tears on a morning where the sun was shining, but the wind was bitter. NYC firefighter Kevin Morrow said Daniel's brother talked about how "Daniel inspired everyone around him to be happy."